"Reggae Faea" One BIG reggae night in Port Vila, Vanuatu. If you find yourself over there on holidays/business then don't miss this wickid night. 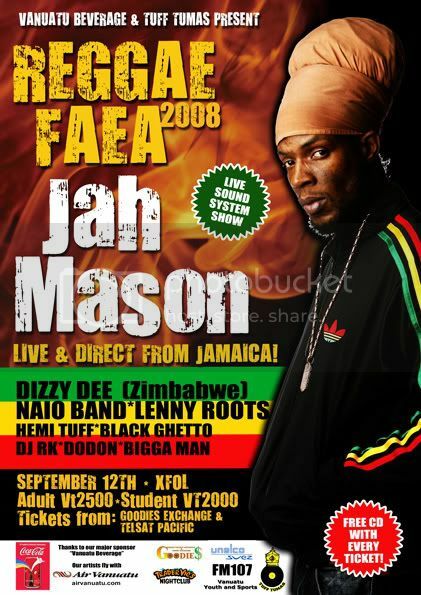 Jah Mason, Naio Band, Selekta Hemi Tuff(Brisbane), Dizzy Dee(Melbourne), Black Ghetto, DJ RK, Dodon (The next Yellowman) Biggaman.....All live at XFOL one night only. Over 6 hrs of wickid reggae, good vibes and island food. Big up Tuff Tumas & the whole Vanuatu massive ... sounds like a REAL nice treat, no doubt the place will ram ! Big respects man! Hemi tuff tumas fe real!